The CBA currently has one vacancy. 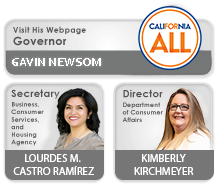 If you are interested in being appointed to the California Board of Accountancy, please visit the Governor's website. You take pride in your work and your profession. You have the technical skills, the interest and the commitment to make a difference. Who better to serve on a CBA advisory committee? Being a member of a CBA advisory committee provides you with an opportunity to actively participate in the regulation of the accountancy profession. You can become an integral part of an organization charged with providing consumer protection amidst changing consumer demographics and the evolving nature of the profession. The CBA is currently recruiting to fill positions on its Enforcement Advisory Committee (EAC), Peer Review Oversight Committee (PROC), and Qualifications Committee (QC). The EAC assists the CBA in an advisory capacity with enforcement activities. The committee offers technical guidance on open investigations, participates in investigative hearings, and reviews closed investigation files. This committee is limited by statute to a membership of 13 licensees and meets four to five times a year, generally for one day meetings, alternating between a northern and southern California city. The PROC provides recommendations to the CBA on any matter upon which it is authorized to act to ensure the effectiveness of mandatory peer review. The PROC is comprised of seven CPAs, and meets four to six times per year, alternating between a northern and southern California city. The QC assists the CBA in its licensure activities by reviewing the experience of applicants for licensure and making recommendations to the CBA. This responsibility includes conducting work paper reviews with applicants or with employers present to verify that the responses provided are reflective of the requisite experience for licensure. This committee is limited to a membership of 16 licensees who have expertise in the preparation of audit and review reports. The QC meets four to five times a year, generally for one day meetings, alternating between a northern and southern California city. Committee appointments are for two year terms; appointed individuals may serve a maximum of four terms. To qualify for possible appointment to a CBA advisory committee you must be actively licensed to practice public accounting for a minimum of two years prior to the appointment and, if appointed, must maintain an active license status during tenure on the committee. Additionally, you must have no pending enforcement actions against your license. You will also be reviewed for any results of QC work paper and continuing education reviews.